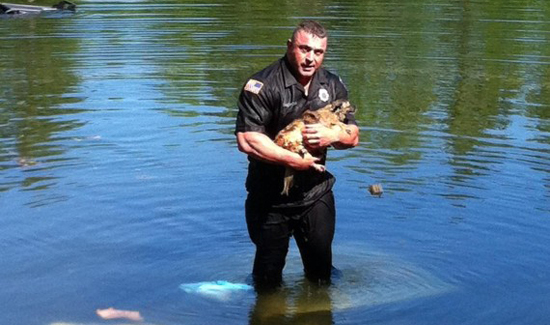 Police officers aren’t just here to protect and serve humans. Whether it’s a family of ducks in need or a dog trapped neck-deep in mud, these brave men and women are here to help. Officer David Harriman and his partner responded to a call after a 59-year-old woman accidentally submerged her truck in more than 8 feet of water in Carver, Massachusetts. The woman was able to escape from the vehicle and another dog swam out on its own, but one dog remained trapped when the officers arrived on the scene. Harriman — an avid dog lover — removed his gun belt and dove into the water in an effort to rescue the stranded pooch, according to a statement provided to HuffPost from the Carver Police Department. He was able to open the door to the vehicle and retrieve the dog, who was returned to its owner and all three victims are now in good health.